Since I spent most of this WDW trip in a conference, I won't be doing a traditional trip report, but I definitely still have a lot of stuff to tell you about that will be loosely collected under the July 2018 trip keyword. Read on! I don't usually put post-WDW trip haul posts - not because I don't think they're interesting, but rather because I rarely get enough to warrant the dedicated word count. I just don't generally buy more than a souvenir at a time lest the percentage of my salary I give to Disney yearly dips from "inadvisable" to "unhinged" territory. And that's why I, yes, I, urbane and eccentric and unique though I obviously am, have been chasing those stupid rose gold Minnie ears across time and space. For the longest time unsuccessfully, because apparently millennials are obsessed with rose gold and everyone went nuts and bought them immediately? I don't know about that; I just really like pink and colors adjacent to pink, cultural zeitgeists not withstanding. Anyway, these have been so popular that even on three separate trips I've never been able to get my hands on them. I've just never been in the right gift shop at the right time. UNTIL NOW. You see, the world has moved on. They now enjoy millennial pink and iridescence more instead (or so the official Disney blog assures me, and they have no reason to lie...?). 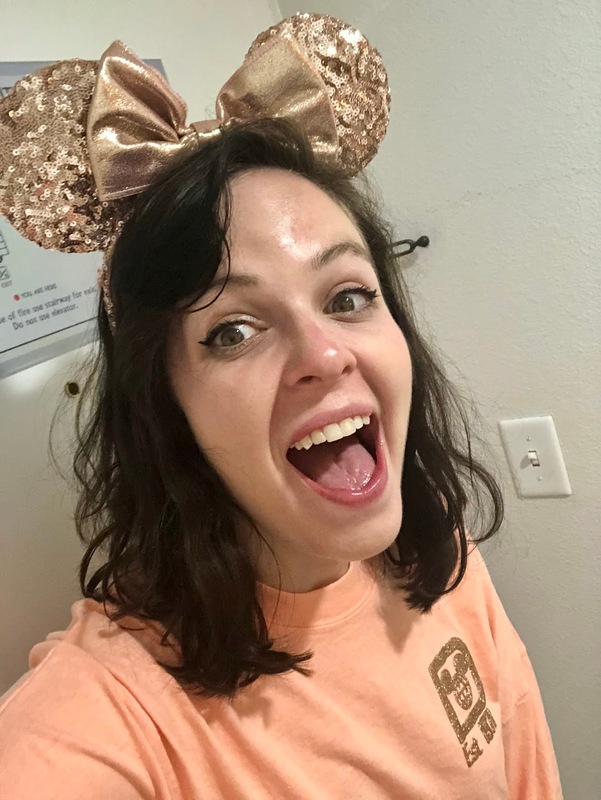 Thus supply finally outran demand, and the rose gold ears can be readily had all over WDW property. So I set out on my free night to Disney Springs, where I finally got my hands on these shiny shiny wonders. I bought my mom a pair too so that next time I bring her along we can match and be REALLY infuriating. And just to really drive down the hammer on my basic bitchiness, I picked up a rose gold spirit jersey too. It's BEAUTIFUL and I regret nothing. I said I WASN'T unhinged. Well, I do regret one thing: on my way home I discovered that both items were in the Disney airport store the whole time. I could've picked them up on my way into Orlando and had them all trip. Ah well. What is beauty but pain? P.S. While slumming it in the Springs, I also got some solid shampoos and conditioners from Basin. I'll let you know how they work out!